Have you ever felt left out of a joke? Such is the case with the latest commercial from AT&T. 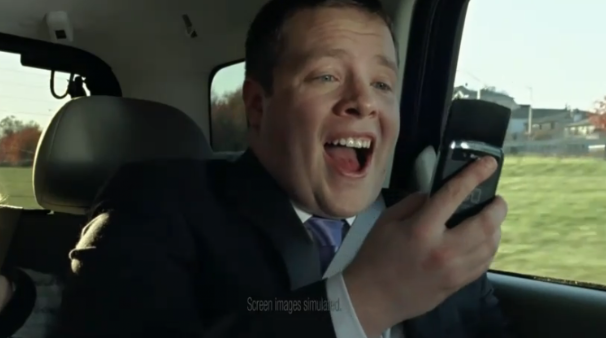 A carpool full of business people are driving along, when one man's phone dings. Ah, a message has arrived! He opens the message and breaks into uproarious laughter ... all while his business associates sit by numbly, wondering what is so hilarious. Moments laughter - after their messages download on to their phones - they simultaneously break out into riotous laughter. Only then are we let in on the joke. The voiceover tells us, "Don't be left behind. AT&T - the nation's fastest mobile broadband network - is getting faster with 4G." I love this commercial. It is a far more effective way to tell me that AT&T has a fast network than lulling me to sleep with maps and diatribes on the speed of their network. AT&T picked a great straight man for the part, a pseudo-nerdy looking guy with a booming laugh, who begs you to listen and watch ... waiting until we, too, can be let in on this great joke.